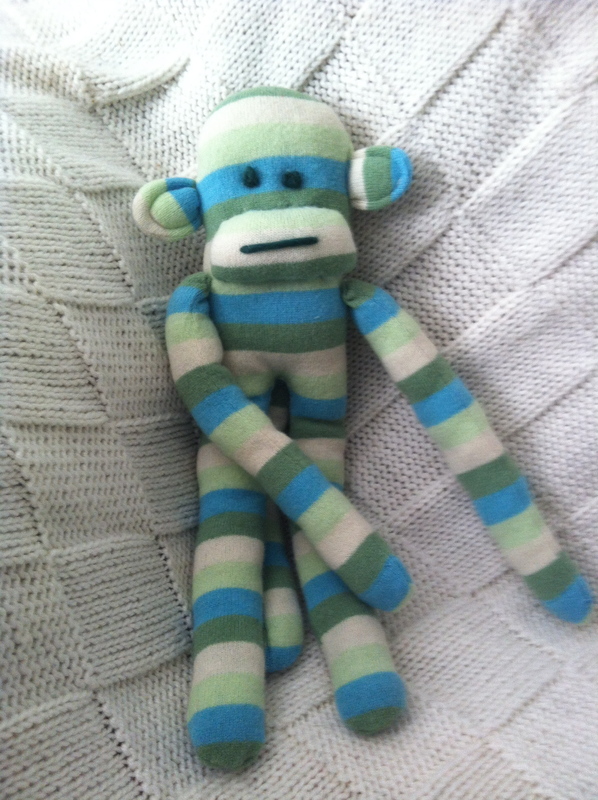 When is the right time to introduce a child to his or her first sock monkey? When they’re born! My awesome culinary school buddy, Loreilee, and her husband JR recently had their first baby. Little Noah is adorable and as cute as can be, and I wanted to make a sock monkey for him to go along with the book of nursery rhymes Rolland and I picked out as a baby gift. I remembered I’d picked up a sweet little vintage wool sweater intending to felt it for a project, but hadn’t gotten around to it. 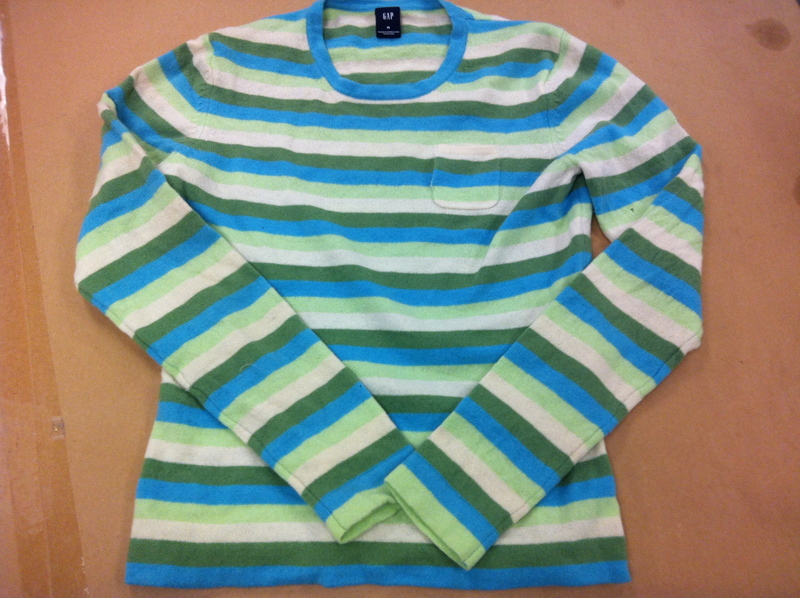 Pastel blue and green with cream stripes, I thought it would be perfect to use for the monkey. I guess by using a sweater it’s technically not a sock monkey, but I’ve been wanting to move past the traditional brown socks used and come up with something more colorful. It’s a little harder than I expected – there just aren’t that many socks out there that work. The ideal candidate has at minimum a contrasting heel – which becomes the mouth and the bum – and hopefully a contrasting top as well, which becomes the feet and hands. A lot of the socks I’ve found that look like they’ll work have a lot of spandex in them and are too “tight” when trying to stuff them and create a character. So even though my vintage sweater didn’t have a heel, the sweater’s stripes were the look I wanted for Noah’s monkey. After gently washing, drying and blocking the sweater, I cut it out and assembled it. The stripes required a lot of pinning to match up, because I’m a bit obsessive on stuff like that. I sat and watched an episode of “Downton Abbey” while I stuffed and assembled him, and planned on adding ears, tail, eyes and mouth the following night, leaving him on the table next to my chair in the living room. 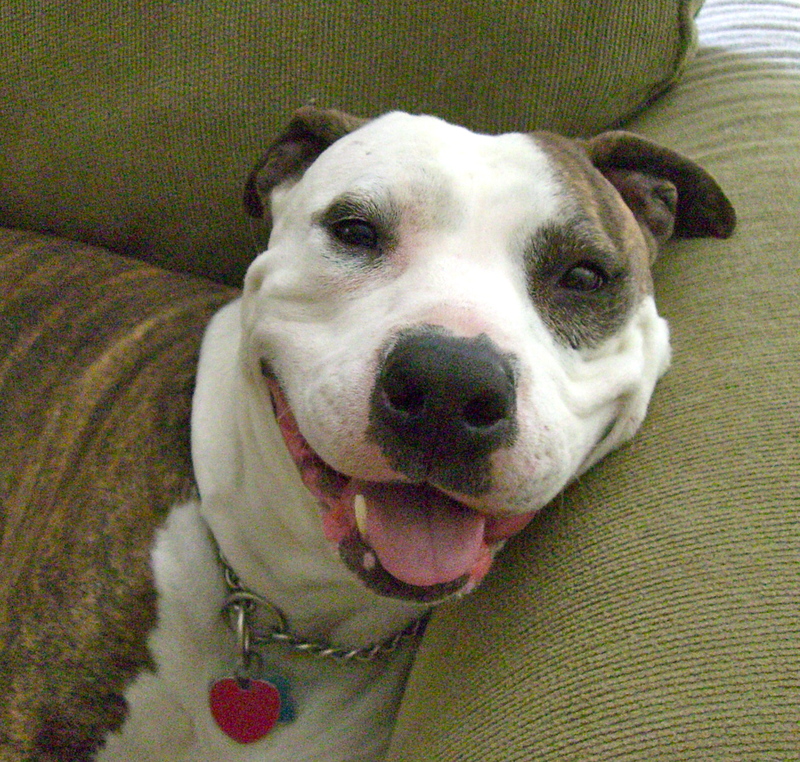 Of course, I hadn’t consulted with my dog Noodle about my plans, and just to remind me of my error, she ate Noah’s monkey. This has happened before. The first time, she just took the monkey and put it in her bed, claiming it for her own. After my initial freak out when I saw it lying there, I told myself it was a good lesson and how lucky I was that she wasn’t interested in chewing it up. The second time it happened was on a road trip last summer, and I’d brought along a monkey to do some detail work on while in the car. Rolland and I stopped at a convenience store during the trip and I put the monkey in a bag and shoved her under the front seat. When we came out ABOUT 3 MINUTES LATER, Noodle had taken the monkey, shredded it, and left its lifeless carcass on my seat. She had this “I told you so” look on her face, and I was pissed, mainly at myself, but also because it was a vintage sock for a monkey that was nearly finished and going into my exhibit at McCaw Hall. So you’d think I’d learned my lesson after the 2nd disaster, but evidently not. Fortunately I was using a sweater, so there was a lot of fabric left. I was trying to use the sleeves as the body to save time, which worked great. Again I cut it out, pinned it, sewed it, stuffed it and planned to finish the following night – this time, leaving the monkey on the middle of the dining room table. And again, Noodle got it, tore it to pieces and left me to find the fuzzy remains on the couch. How she got it off the dining table, I don’t know – she’s never climbed onto a chair to get up there before, but I guess she wanted to expand her skills that day. I still had some sweater left, and started monkey #3. As it was a vintage sweater, there were a few moth holes in it, and now it was harder to cut out the larger pieces I needed – I was able to save the arms and tail from the first two disasters, but the body of the monkey ended up being shorter than the others to avoid the holes. After assembling the newest attempt, I placed it in my dresser drawer in the bedroom while waiting to finish the detail work on it. Noodle was pretty annoyed that she was unable to grow opposable thumbs immediately and open the drawer, but I was able to finish the monkey without further chewing. "I am Noodle and I get what I want. Got it?" Because it was for an infant, I had to forego the button eyes (choking hazard). I made jumbo French knots from wool yarn and used the same yarn for a mouth. I loved the result and so did Noah – he snuggled right up to it in his stroller and went to sleep. I named this monkey “Third Times a Charm” – or just “Three” for short. 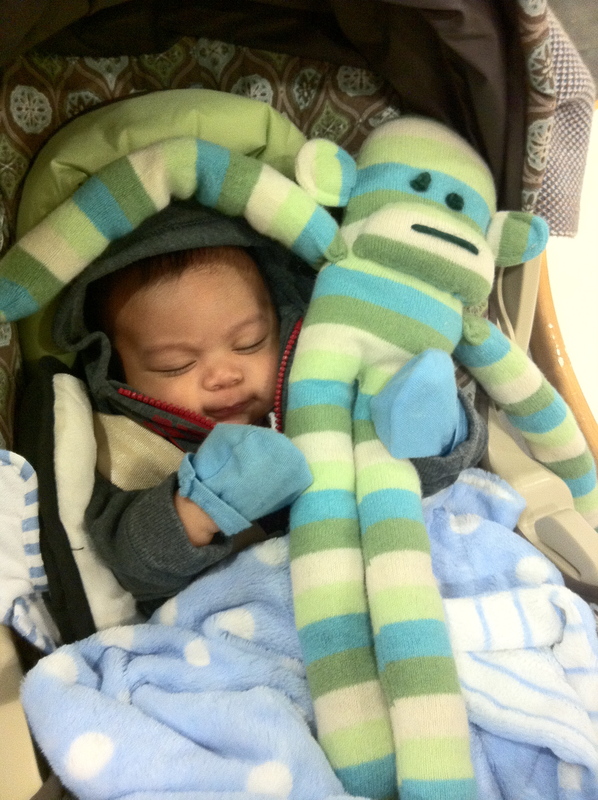 And of course Noodle is still waiting to teach me who’s boss the next time I start another monkey…..
Baby Noah loves his monkey! This entry was posted on April 27, 2012 by scootrah. 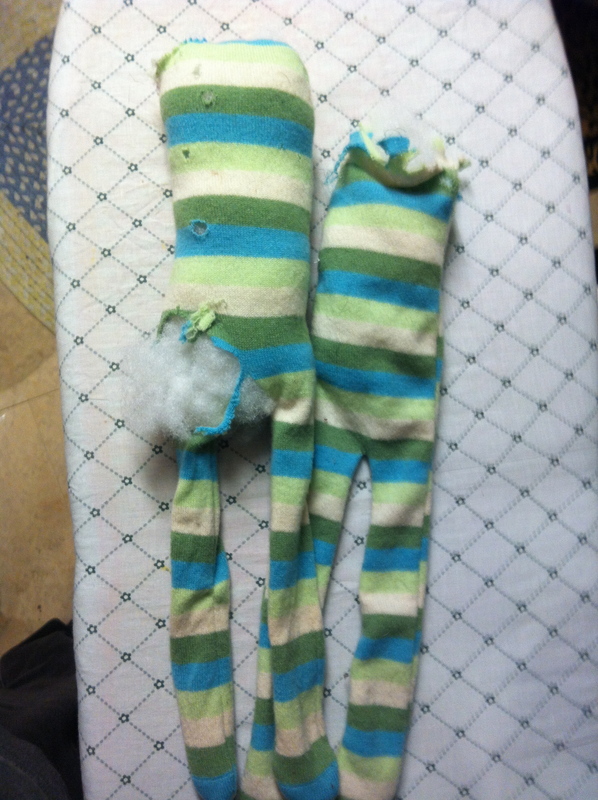 It was filed under childhood toy, Noodle and was tagged with baby sock monkey, Noodle, Scott Arend, Scott Arend's sock monkeys.